Bob has taught art at secondary level in Derbyshire and London for over 20 years. He was one of the leaders in developing 'basic design ideas' in art education in the early 60's. During the 60's and 70's Bob exhibited large abstract paintings, mosaics and metal constructions in many top galleries across the country. 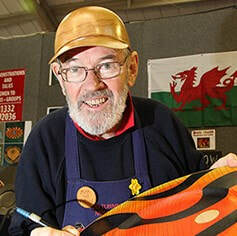 His experience of using wood, metal and plastics took him into another area in the seventies - designing and making toys for disabled children. In 1975 he was awarded a Winston Churchill Travelling Scholarship in order to exchange ideas with toy designers in the USA and Canada. By the late 70's he had become part of the pyrographic revival - a traditional craft practiced for many years in South America, Africa, Poland and other parts of Eastern Europe. Bobs decorated turned work developed through his many contacts on the 'craft fair' circuit during the early 80's and his teaching at craft supplies. In 2003 he was awarded a Shackleton Trust Scholarship - teaching pyrography in the Falkland Islands.